First I’ll explain how you can debug a hanging (seemingly infinite loading) of your IIS website. Then I’ll write a bit about my specific problem; in short the application pool targeted the wrong .NET framework version. Normally a request times out after approximately 2 minutes (120 seconds), but sometimes the loading lasts alot longer. If that is the case then it might be your application pool that is hanging or loading indefinitely. 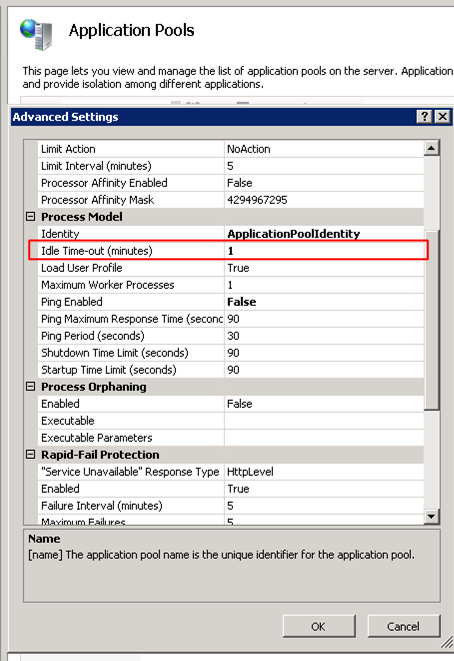 Reduce the loading timeout duration for the application pool and you should be much easier be able to debug the error. My IIS website was hanging for no apparent reason, it was fully configured – or so I thought. Turns out my webapplication was targeted at the .NET 4.0 framework, while my web application targeted the 2.0 version. Find a line that looks something like this in your web.config file. This entry was posted in IIS and tagged application pool, IIS website, web application. Bookmark the permalink.